“Team Israel” fields a team of mostly non-Israeli Jews in the World Baseball Classic that may bring players closer to Judaism and Israel. Strike One! 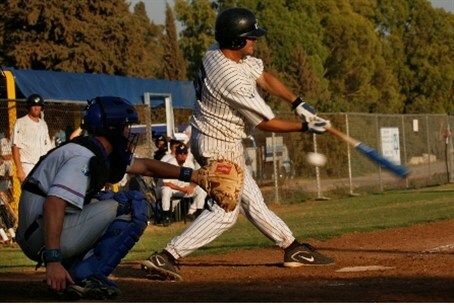 Israel baseball player, 2007. The “Israeli” team is favored to beat a South African team in the first playoff in Florida on Wednesday, on the way to decide who will win the four spots open for grabs for the 16-team finals. Promoters of baseball in Israel, where America’s national pastime has struck out, are hoping a victory in the tournament will help rejuvenate support for the game. Israelis, used to fast-paced soccer, have been turned off by relatively slow motion baseball games and have had little patience in trying to understand the rules of the game. All countries participating in the tournament are allowed to use players from other countries who are eligible for citizenship. The rule allows Team Israel to line up Major and Minor Leaguers who are Jewish and can be Israeli under the Law of Return, although many of them are far from being Jewish under rabbinic law. Team Israel fields 28 men, only three of whom are from Israel. Israel has only one real baseball field, the others being soccer fields and other open areas where a pitcher’s mound, foul lines, home plate, and three bases are erected. Peter Kurz, the American-born secretary general of the Israel Baseball Association (IBA), is hoping success in the World Baseball Classic will help the IBA raise approximately $4 million for a real baseball stadium in Ra’anana, located in metropolitan Tel Aviv. The manager of Team Israel is Brad Ausmus, whose mother is Jewish, and Shawn Green is a player-coach. Green has hammered more home runs than any other Jewish Major Leaguer since Hank Greenberg decades ago. Players who barely know they are Jewish might come close to their roots, and Israel, by virtue of their joining Team Israel. Several players had to search for certificates of the Bar Mitzvah to qualify, and The New York Times reported that one outfielder, who said his mother is Jewish but is “pretty much nothing" himself, was able to join the team after his mother presented documents from her father’s synagogue. The addition of American Jews boosts Team Israel’s chances to win. All-Israel teams have had a history of Little League tournament disasters, such as a 51-0 loss to a Saudi Arabia team, largely manned by American players, in 1989.